Today in Afghanistan’s eastern province of Khost, Pamir Institute, the first-ever private higher education in the province was officially inaugurated and opened, according to a report from Afghanistan’s Bakhtar News Agency. The provincial governor, Abdul Jabbar Naeemi, community leaders, teachers, and students attended the ceremony. 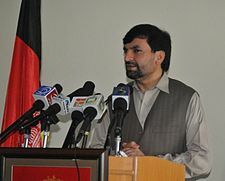 The school was founded by Professor Syed Karim Shah Nekmal, and it will offer higher education in computer science, language and literature as well as economics. Yesterday, Afghanistan’s Ministry of Education announced that two new school buildings will be built in the the eastern province of Kapisa. According to a ministry official, a foundation stone laying ceremony was held to mark the event. The first building will be for the Allah Mohammad Shaheed High School and it will have 6 classrooms and 1 administrative room. The second building will be for the Qari Mir Asman High School, and it will have 8 classrooms and 4 administrative rooms. Both schools will be provided with tables and chairs as well. The project is expected to take 6 months at cost of $210,000. Funding for project is being provided by Japan.